Last couple of days have been a blur. It’s been crunch time for writing and editing. Not sure this post was completely necessary considering the two others we’ve had this week. But a schedule is a schedule and it’s best not to break it. Other than that not much else has happened this week. Our Items, Spells and other such lists near completion and will undergo having their writing done up in the next week or so. After that they will be compiled into our compendium, dubbed, The Locked Safe and formatted for printing. Not a lot of art has been done and there won’t be much until after Babscon next month. Most of what will be happening is book writing, and prepping for our Panel. So expect a lot of short or boring updates for the next while. Greetings Wastelanders. I’m taking over for the posting this weekend, as it seems the site has been infected by a slew of A’s from our Canuckian correspondent. I come baring good news, the rewrite of the wasteland survival guide is finished! -hold for applause- Now for the revisions and finalization of everything. Back to the keyboard. See you all at BABScon! i dunno we’re game writers with computers I guess? quotes started coming in, helping us decide who we want for manufacturing! Guess who almost forgot to make a blog update. Things have been pretty hectic this week. We’ve been prepping for BABScon, getting our presentations underway. The last mini figurine was sculpted and staff have started prepping things like travel arrangements and hotels and whatnot. Book writing has continued as normal and the major bits of art are almost done. We’ve also started scouting out all the manufacturing we’re going to need. Talking to printers and manufacturers and what not looking at what we’ll need to get done. Other than that there’s not much else I can say without giving away trade secrets. So with that I’ll you fine folks next week! BABSCON! BABSCON! Bronies come and play! We’re gonna make this thing amazing in the San-Francisco Bay! That’s right Folks! You heard it here first! 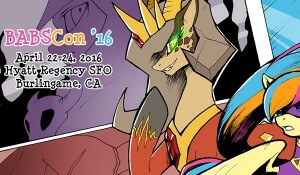 Dead Tree Studios Officially has a Panel at BABSCon! Happening the 22nd-24th of April, 2016 at the Hyat Regency SFO, Burlingame, California! Come check us out at our panel as we will be going in depth about our Fallout Equestria PnP Print projects, Show off a bunch of our art, some figurines even Some Demo books! We’ll also be talking about future projects, Timelines, answer questions and MAYBE host a game or two in the Games room. This Panel is going to be our major press release folks, so grab your Dice and good luck, cause it’ll be a wasteland in the panel room! So, like usual, a bunch of boring things happened this week. We got some more art done, we got other art done, and arted some other art. Yes ladies and gentlemen. Most of what happened this week was art. On the not Art side of things. 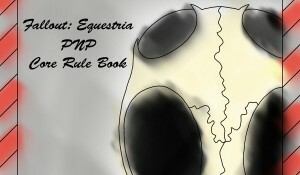 Our “Wasteland Survival Guide: Fallout Equestria PnP Core Rule Book” got past the writing stage. all the words got worded and edited and now were gonna stuff it into Adobe Acrobat, add some pretty pictures and do all the formatting for printing YAY! Good Morning Dead Tree Fans! It is I, L9OBL back with some more updates! First off, our Core Rule book, is maybe a week or so out from having all the writing done. After that’s Set, we will be able to start formatting it! After that Some awesome art was finished, and we started turning our printable character sheet into a PDF form to make it easier for those wanting to fill one out. 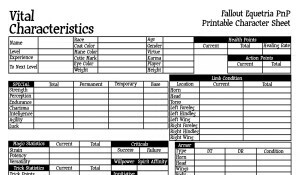 And also for pre gen character sheets that we will be taking to cons and what not. Can’t forget the Pre Gen Character Sheets. And that’s the Dethklock Minute. umm, I mean, the Deadtree… Paragraph…? Good evening Dead Tree Fans! This week actually brought a lot of cool things in the world of killing trees. Most notably on the list, is that our website underwent a bunch of cool minor and major updates. The Gallery was also updated with mini fig pictures and some WIP art. On the not so notable side We have completed the 3rd revision of our printable character sheets. Which you may find the first two pages of in the gallery. More editing and writing was also completed and a bunch of art was worked on as well. and despite the niggling feeling that i’m forgetting something. That seems to be the High and Low of what got accomplished this week. At least from what I recall. Greetings, my name is Moonhoof, or Moon, and the fifth member of Dead Tree Studios. 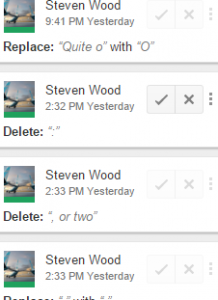 I’m the lead writer here at DTS, which means I have the task of writing all of the books. ALL the books. Right now, we’re in the homestretch of prep-work with our books and other goodies. I’d say more but the NDA forbids it, :(. SOOO, that means you’re just gonna have to come see us at an MLP convention near you. Maybe. It kinda depends on if you’re stateside or in the middle of nowhere, siberia. Then sorry, we won’t be near you. But, ya know, planes exist!! Anyway, I’m getting off topic. Its a pleasure to finally address you all. I look forward to finally being able to unvail all our hardwork.